Lefty Toshiya Sugiuchi won a pitching duel against veteran right-hander Daisuke Miura as the Yomiuri Giants beat the Yokohama BayStars 2-0 on Sunday afternoon. Leadoff hitter Daisuke Nakai hit a two-run homer off Miura with two outs in the fourth inning at Tokyo Dome. Hisayoshi Chono led off the fourth with a single to center and one out later reached second on Sugiuchi’s sacrifice bunt, setting the stage for Nakai’s homer. The line drive, which Nakai hit on the first pitch, bounced off the left-field foul post. Sugiuchi (7-4) had his breaking ball working as he limited the Yokohama bats to two hits over eight strong innings, featuring eight strikeouts. Tetsuya Yamaguchi escaped a two-on jam in the ninth, getting Tony Blanco to hit into a game-ending double play. The 39-year-old Miura (6-6) scattered 10 hits over seven innings. He struck out seven and walked two. Giants captain Shinnosuke Abe, who had been sidelined for three games due to pain in his right side, singled in a pinch-hit performance in the eighth. 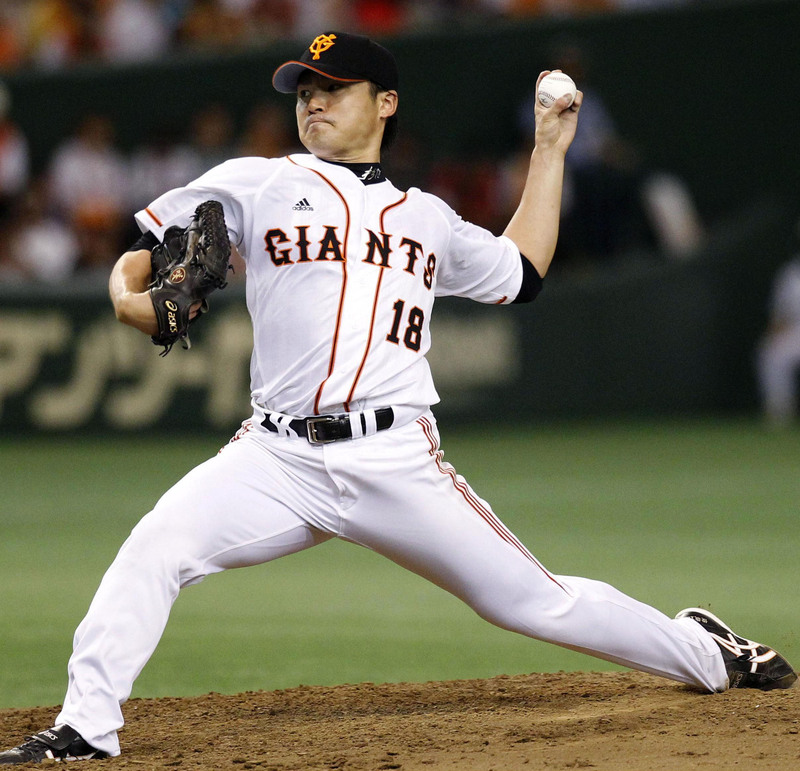 “He (Abe) should be ready to start in games by next week,” said Giants skipper Tatsunori Hara. At Mazda Stadium, Shintaro Fujinami went six scoreless innings on three-hit ball to win his first decision since May 26, Takashi Toritani broke a scoreless tie with a solo homer in the sixth, and Hanshin blanked Hiroshima. Ken Maeda (6-5) took the loss. Toritani appeared in his 1,251st consecutive game, surpassing Hideki Matsui and giving him sole possession of the third longest streak in Japanese baseball. Hiroshima lost its fourth straight and fell a season-worst 12 games below .500. At Nagoya Dome, pinch hitter Hiroyasu Tanaka had a tiebreaking RBI single in the 10th inning and Tetsuto Yamada drew a bases-loaded walk as Tokyo Yakult pulled past Chunichi. Tetsuya Yamamoto (1-2), the sixth pitcher for Yakult, got the win in relief. Yuki Shichijo picked up his first career save. Chunichi closer Hitoki Iwase (1-1) was tagged with the loss. At Yafuoku Dome, Andruw Jones hit a grand slam in a six-run eighth, Brandon Duckworth threw seven scoreless innings, and PL leader Tohoku Rakuten routed Kazuyuki Hoashi (5-4) and Fukuoka Softbank to move a season-high 11 games above .500. After a run scored on Kazuya Fujita’s one-out fielder’s choice, Jones went deep to left-center with the bases loaded to break the game open. Duckworth (4-3) won his third consecutive decision against Softbank, which dropped into fifth. At Seibu Dome, Hideto Asamura keyed a six-run second with his bases-clearing triple, Takayuki Kishi allowed two runs in eight sharp innings, and Seibu sent Chiba Lotte to its fifth straight loss while winning five in a row. Kishi (4-5) struck out five and walked none. Yuta Omine (4-2) was chased after surrendering six runs in 1⅔ innings. Takumi Kuriyama hit a two-run homer in the seventh inning and Ryan Spilborghs went 3-for-4 with a run scored. At Sapporo Dome, Shohei Otani had a bases-clearing double with two outs in the third to get his first hit as a 19-year-old, Michel Abreu hit his 20th homer leading off the fifth, and Hokkaido Nippon Ham downed Orix. Sho Nakata went 3-for-4 with two runs scored. Yuya Ishii (3-3) won in relief. Yuki Nishi (6-3) was roughed up for six runs in four-plus innings for Orix, which squandered bases-loaded opportunities in the fourth, fifth and sixth innings.